Are you the kind of shopper who always type "vintage" and "collectibles" in the search box of Ebay or online shops? Do you love to go to places and stores which sell antique items and collectibles? Do you get excited with the sight of old phones, transistor, limited edition memorabilia or one of a kind jewelry piece? Then, this event is for you! The COLLECTICON, Nuvali Collector's Fair! It would happen on September 11 from 10 AM to 6 PM at the Solenad 1 Activity Center in NUVALI, Santa Rosa Laguna. What to expect? Pre-loved, brand new, mint condition, rare, and collector’s items ranging from toys, books, furniture, vinyl, and more that will surely bring tears of joy to any vintage lover and collector’s eye! 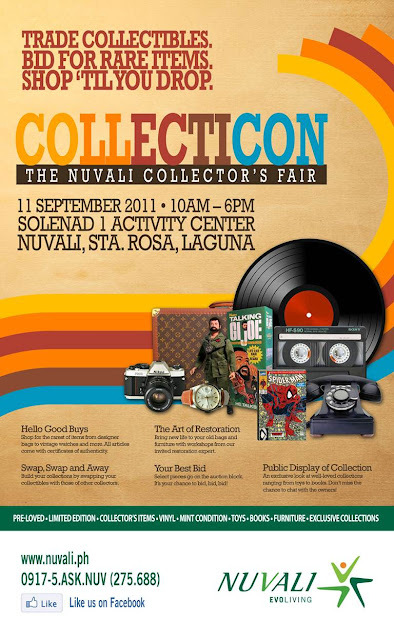 Nuvali’s Collecticon is a day of buying and swapping awesome vintage goodies as a way of reusing and recycling them, instead of buying new items and throwing things away.The day will also play host to an exciting auction, allowing collectors to bid for rare items. Also happening on the same day are talks on the art of restoration, as well as exhibits and displays of rare items that’ll no doubt bring a sense of nostalgia to many vintage lovers and enthusiasts. I do love vintage pieces and collector's item and I am excited about the event - unfortunately, it is too far from my place. I have been wanting to visit that Nuvali too but I just couldn't find the time.